Try to cook fresh chicken whenever possible. It is best to avoid freezing in order to prevent additional moisture loss during thawing. In case you need to store the chicken in the refrigerator, keep it tightly wrapped to prevent it from drying out. You can leave the skin in the chicken while cooking it in order to retain the juices and increase its tenderness. It is essential to cook the chicken to the proper temperature, because, undercooking can toughen it which overcooking can lead to moisture loss, making it drier. When frying or sautéing chicken pieces; always use a non-stick skillet. It requires less oil and reduces the amount of oil being used in the dish. You can use low-fat variety of yogurt and curd to marinade the chicken in order to limit the calories in the recipe. While frying or sautéing the chicken; start removing the pieces from the pan as they are about to get done in order to avoid overcooking. The smaller pieces and white meat from the breast and wings take less time to cook compared to the dark meat from the legs and thighs. Don’t overcrowd the chicken while cooking. Leaving some space in between the pieces will allow them to cook evenly. Let us begin the list of best Indian chicken recipes with Butter Chicken – the most popular chicken recipe not only in India, but all around the world. Butter chicken consisted of marinated chicken cooked in a mild spicy curry sauce. The secret of the taste lies in the prolonged hours of marination. The Butter Chicken is a gravy dish best served with roti, paratha or naan. Although, the name suggests that the chicken is entirely cooked in butter, but that is not the case. The recipe makes minimal use of butter and other fats which gives it a healthy touch. You can use non-fat yogurt and cream to make it even healthier. The spicy Indian Chicken Curry is simple and easy dish that is widely prepared in Indian households as a weekend delicacy. In this recipe the chicken in cooked in flavorful onion-tomato gravy and flavored with spices. 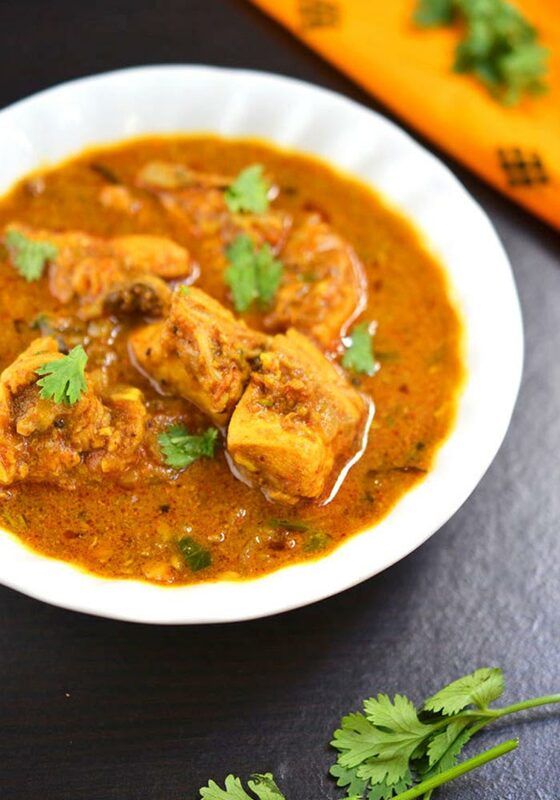 This chicken curry can be served for lunch or dinner and it goes well with rice and roti. This is a simple and healthy chicken recipe that does not call for deep frying or grilling the chicken. It does not require any fats such as butter or ghee for enhancing the flavors. The rich red color is achieved by grinding Kashmiri red chilies; no food color is used in this recipe. 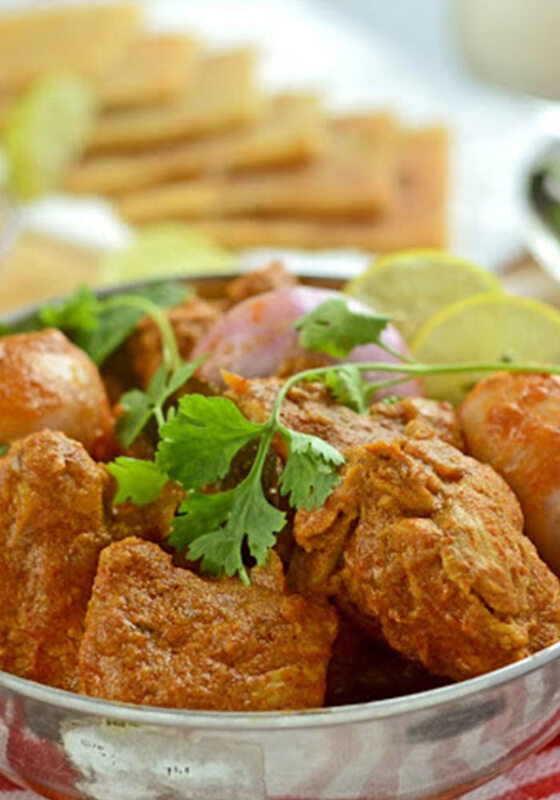 Chicken Do Pyaza is yet another popular Indian chicken recipe that reveals a perfect balance of sweet and sour taste and it is bursting with flavors. The phrase “Do Pyaza” refers to the two ways in which onions are used in this recipe. It is a mellow spicy recipe that goes well with roti, paratha and kulcha along with a dash of raita. Although, the recipe looks rich and spicy, it makes minimal use of oil and fats. The generous amount of onions used in this recipe helps to supply some phytochemicals and vitamin C to the body that boosts immunity and reduces inflammation. Chicken Tikka Masala is the super star of Indian cuisine that is hugely popular in the UK and USA. Tikka masala is prepared by marinating chunks of boneless chicken in a spicy mix, then grilling them and finally simmering them in a velvety tomato sauce. The versatile nature of the dish makes it a perfect accompaniment for rice and roti. The best thing about this chicken recipe is that it is mellow and non-spicy which makes it suitable for the whole family. This recipe does not require any deep frying; the marinated chicken pieces are baked to perfection in the oven itself. Murgh Rezala or Chicken Rezala is a renowned chicken recipe that has its origin in Bengal. The Murgh Rezala is prepared by cooking the chicken pieces in flavorful and light white gravy. The yogurt, oil and spices form layered gravy that is bursting with flavors. It tastes best with Roti, naan and other Indian flat breads. Despite the use of spices and oil, this chicken gravy is exceptionally light with mellow taste and flavors. It tastes almost like a flavorful chicken stew or soup with layers of yogurt and spices on top. 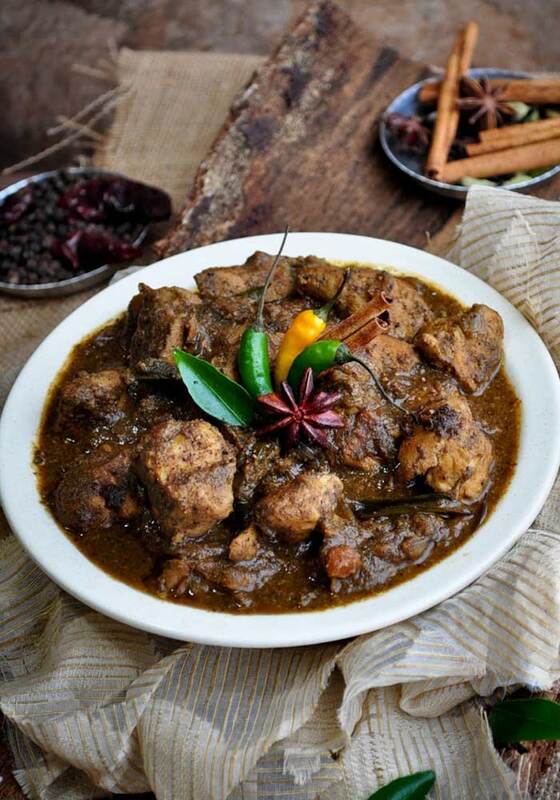 Chettinad Chicken Curry is a flavorful and spicy chicken dish that has its origin in the Chettinad region of Tamil Nadu. The combination of chicken and coconut in this recipe renders a tropical flavor to the dish. The overpowering flavors of the dish come from the special dry roasted spice made by combining a number of ingredients. It is a hot and spicy recipe which is best to enjoy occasionally. You can adjust the hot spices such as pepper corns and red chilies in the recipe as per your taste. The use of coconut oil in this recipe gives it a healthful touch and helps to supply some healthy monounsaturated fats to the body. Kodi Kura or Andhra Style Chicken Curry is the ultimate comfort food for weekend meals that is exceptionally simple to make, but tastes amazing. The perfect combination of spices and chicken brings out the rustic flavors of Natu Kodi Kura (village style chicken curry). It tastes excellent with steamed long grain rice. The marination already softens the chicken and therefore, the recipe does not require too much of oil while cooking. Most of the spices used in the recipe are whole spices which enhances the flavors without adding any calories to the dish. The recipe does not make use of heavy cream or yogurt which helps to keep the gravy light. Palak Chicken is a non-vegetarian version of the famous Palak Paneer and it is a delicious and healthy North Indian cuisine. 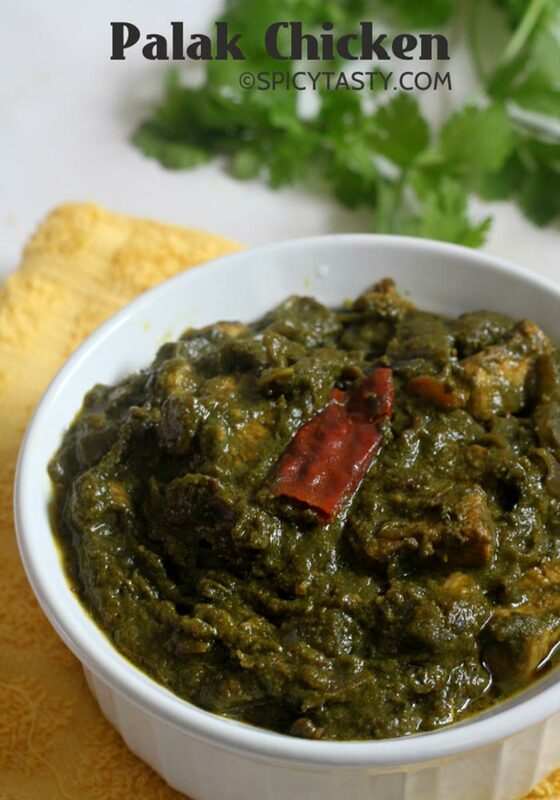 The Palak Chicken is prepared by cooking the chicken pieces in spinach gravy. The fresh green spinach renders an appetizing color to the curry and the spices beautifully mask the vegetal taste of the spinach. Combination of chicken and spinach in this recipe gives a wholesome nutrient punch to it. Spinach is packed with antioxidants, beta-carotene, potassium and vitamin A which helps in diabetes management, aids cancer prevention, lowers high blood pressure and supports healthy skin and hair. 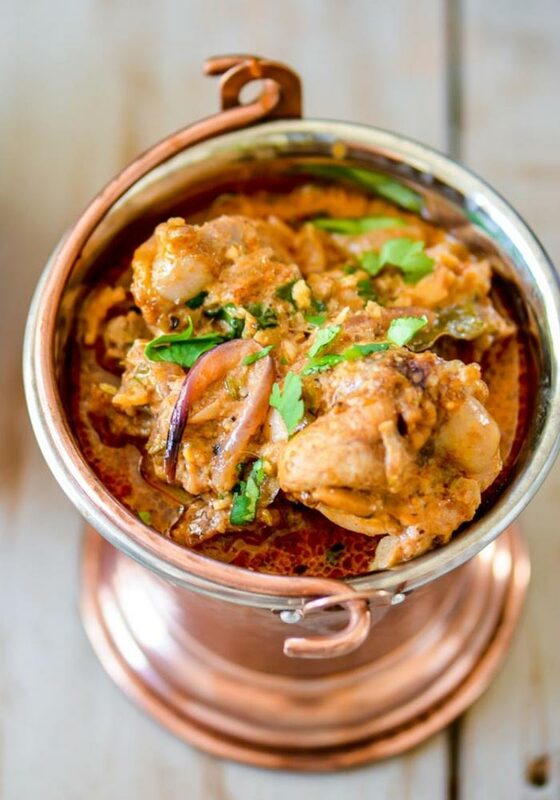 Kadai Chicken is a delicious and flavorful Indian chicken gravy recipe that has been influenced by Pakistani cuisine. 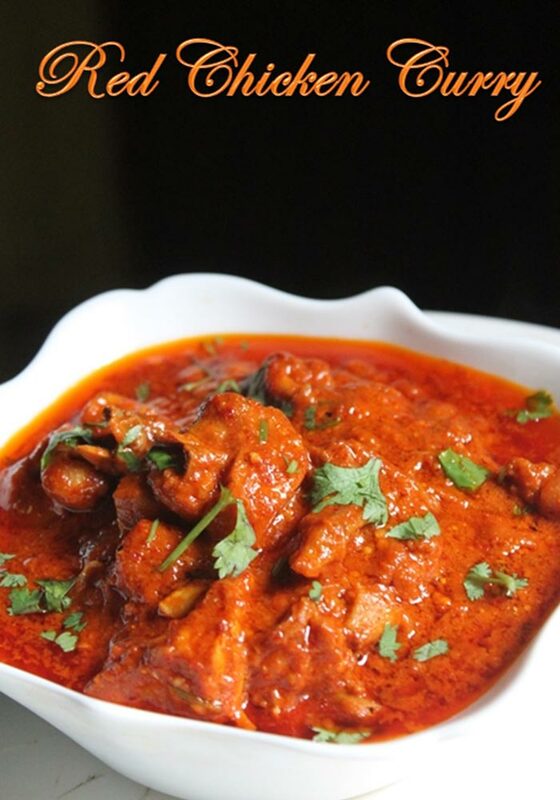 Kadai Chicken is prepared by cooking the chicken pieces and fresh capsicum in sweet-savory tomato gravy. The appetizing flavors of this recipe are attributed to the special Kadai masala prepared by mixing a number of whole spices. Capsicum or green bell peppers used in this recipe are packed with antioxidants, vitamin A and vitamin C that neutralizes inflammation, Promotes healthy tissues, improves cardiovascular health and reduce the risk of cancer. Chicken Jalfrezi is a popular Indo-Chinese Chicken recipe in which the chicken pieces are shallow fired and then cooked in thick tangy-savory tomato gravy. It also includes red and green bell peppers, onions and tomatoes. 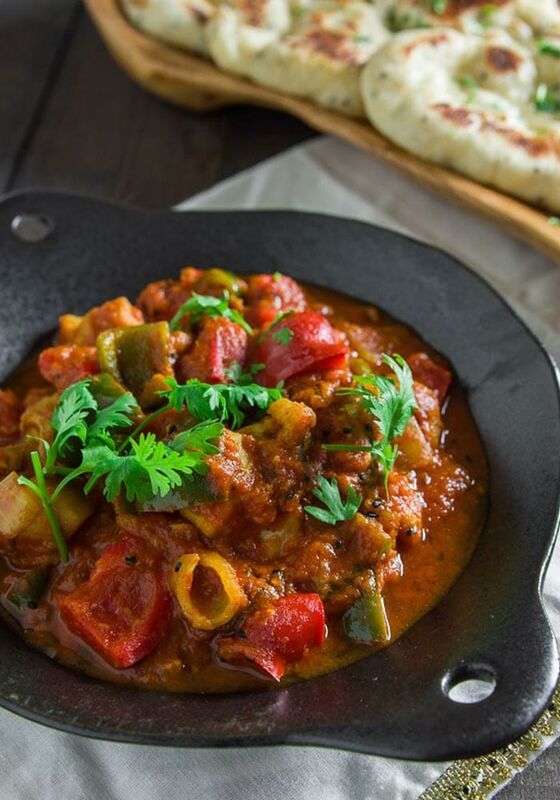 Jalfrezi is a hot and spicy dish that can range from medium to a very hot one. You can adjust the spiciness by reducing the amount cayenne pepper. The colorful bell peppers are a rich source of antioxidants such as vitamin C, vitamin A, vitamin E and folate – all of which benefit the immune system. B-vitamins and minerals in bell peppers support growth and development, reduce the risk of cancer and develops strong bones and connective tissues. Chicken Korma is an aromatic and mild chicken gravy recipe that consists of braised chicken cooked in a yogurt and cream sauce. It tastes best with fragrant Basmati rice. Despite the use of a variety of spices, the curry is not overwhelmingly hot, thus, making it suitable for the entire family, including kids. The use of canola oil for cooking enhances the healthful aspects of the recipe. This recipe does not make use of butter or ghee which helps to keep it light. You can tone down the hotness of the gravy by reducing the amount of black pepper powder and red pepper flakes. Methi Murgh or Chicken with Fenugreek leaves is an exceptionally flavorful and healthy chicken recipe that can be enjoyed as a light weeknight meal. It goes well with both rice and roti. The addition of coconut milk/cream adds a rich and creamy texture to the gravy. Both Methi and Coconut milk used in this recipe are extremely healthy. Coconut milk is a rich source of monounsaturated fatty acids that have numerous benefits for health. Fenugreek leaves are rich source of iron, magnesium, manganese, vitamin B6, fiber and powerful phytonutrients that support and improve overall health. 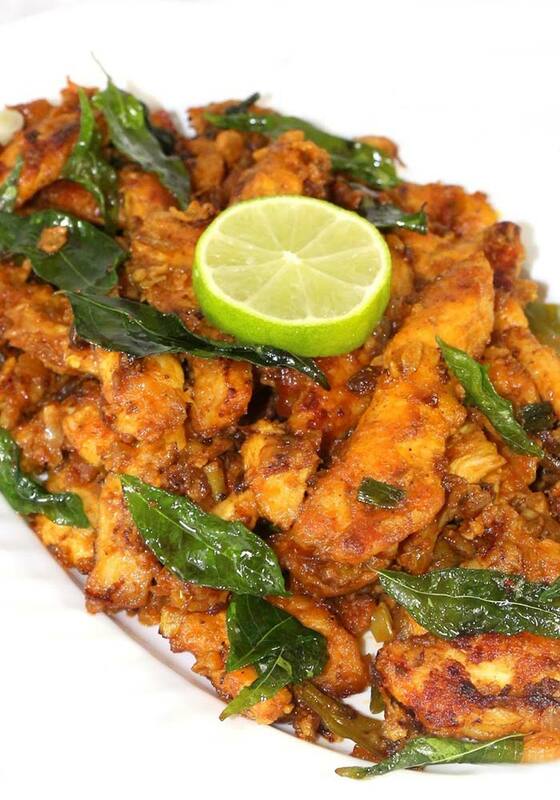 Chicken 65 is an extremely popular South Indian chicken recipe that is enjoyed as a savory appetizer or quick snack. It is a deep fired and flavorful dish. The strong flavors of the chicken can be attributed to the generous use of red chilies and curry leaves. This is a deep-fried and spicy chicken recipe and therefore, it is best enjoyed as an occasional treat. In most cases, restaurants use a food color in order to render a bright red color to the chicken, but no food color or flavors has been added in this recipe. Chicken pakora is a delightful and tasty tea time snack that can be made in a jiffy and is loved by young and old alike. The chicken pieces and coated with chickpea flour and spices mixture and deep fried in oil. It is delicious and filling snack that tastes best with green chutney or tomato sauce. This is yet another deep fried chicken appetizer, but you can soak the excess oil from the pakora by placing them on paper towels. The mixture of corn flour and eggs helps to keep the batter light and easy to digest. Chicken Tikka is a healthy and delicious snack suitable for parties and gatherings. Although, the marination takes 2 to 3 hours, but the actual cooking is done in less than 30 minutes. You can prepare it in a grill or on a skillet on your stove. The chicken cubes dipped in yogurt and spice marinade taste heavenly. Chicken Tikka is the perfect snack for health conscious people, because it is extremely low in calories and fat and packed with protein. The recipe does not involve any deep frying, it is grilled or cover cooked in a tawa or skillet. Chicken Majestic is yet another popular and delicious Andhra style chicken recipe that is served as a starter or appetizer before a meal. In this recipe, thin chicken strips are marinated in butter milk for a few hours which turns them extremely tender. Then they are shallow fried in oil. The prolonged marination of the chicken in butter milk already softens the chicken; therefore, not much oil is required to fry it. It is a healthier option compared to other deep fried chicken starters. 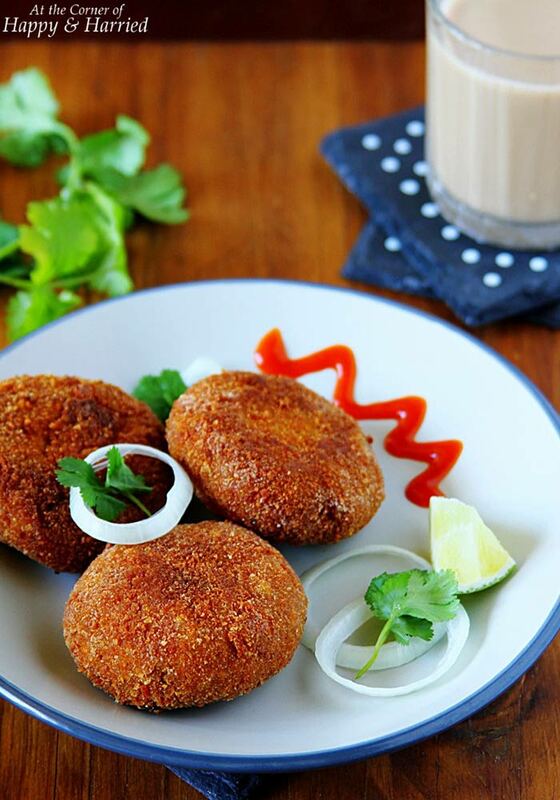 Chicken Cutlet or crispy Indian Chicken Croquettes are an extremely common snack all over India and it tastes delightful with a cup of piping hot tea or coffee. The crispy and crunchy bread crumb coating gives way to soft and chewy chicken and potato filling that almost melts in the mouth. Although, a deep fired snack yet it is wholesome and filling. It is packed with nutritious ingredients such as chicken and potatoes that more than makes up for the frying. 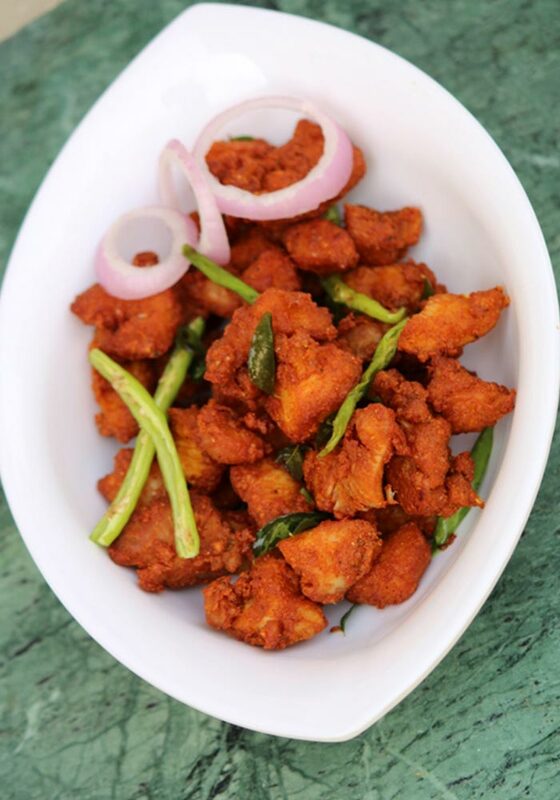 You can adjust the spiciness of the cutlets by omitting green chilies and lowering the amount of red chili powder. Tandoori Chicken is by far the most popular Indian chicken recipe that originated in the Indian subcontinent and is hugely popular in South Asia, Malaysia, Singapore and the Middle East. This recipe involves slow roasting of yogurt marinated chicken in a clay oven or electric grill. The soft and juicy chicken tandoor can be enjoyed with chutney or with roti or flat bread. The best thing about Chicken Tandoor is that is does not require any deep frying. The chicken turns tender with overnight marination and the rest of the cooking is done in a grill or clay oven. This recipe does not make use of ghee or butter which helps to keep it light. The Garlic Chicken is a simple and easy chicken recipe bursting with flavors and not at all garlicky. The chicken is marinated in a mixture made of yogurt, lemon juice and crushed garlic cloves with turns the chicken soft and tender. It tastes amazing all by itself or paired with roti or paratha. The entire cooking is done in olive oil which gives a healthy touch to it. Garlic, one of the main ingredients in this recipe is packed with active component called alliin that has cardiovascular benefits and cancer-fighting properties. It can reduce the risk of stroke and lower the level of total cholesterol and harmful LDL cholesterol. Samosa is one of the most popular tea time snacks that can be either baked or fried and packed with savory and spicy filling. The Chicken Samosa is a super crispy snack packed with spicy chicken and peas filling. It tastes best served with mint chutney or tomato sauce. If you are not a big fan of deep fried food, then you can bake the Chicken Samosa in a oven instead of frying them. The combination of peas and chicken makes it a wholesome and filling snack that can be enjoyed by the entire family. So, now that you know the step by step procedure for preparing some of the most popular Indian chicken recipes; try them out in your home and impress your family and friends with your culinary skills.